Today was a nice and sunny winter Sunday, with outside temperatures around -6°C. From the weather camera capturing an image every minute, a time-lapse video covering approximately 12 hours is assembled. It shows the changing weather conditions plus a few cross country skiers enjoying themselves in the sunshine. It takes about 3.5 minutes to show. I think you also agree that the Raspberry PI weather camera does a pretty good job with the heater system keeping it in focus! The video was created automatically by first generating a label in the bottom left corner of each image. The information about exposure and camera temperature sensors is taken from XML files generated by the on-board RPI software. Second, 3 interpolated images between each pair of originals were created, effectively giving the impression of images taken every 15 seconds. The XML generation, image interpolation and labelling software is home grown. The final step was time-lapse video generation using ffmpeg. A bash script running under Kubuntu orchestrates the whole thing, but a very similar process can easily be achieved under e.g. Windows. 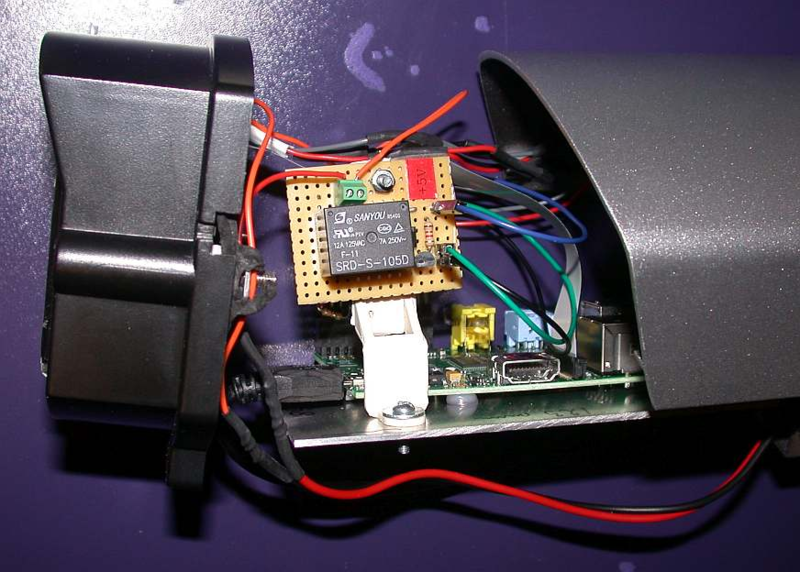 In the Raspberry Pi Lens Heater post, the motivation for heating the RPI camera lens when operating in cold temperatures was given. A prototype version of a heater system was also presented, it has worked very well since early January. The images were significantly sharper when the lens is heated to around 15-20°C. Even well before that, the effect is significant. Temperatures in January have been rather mild, around 0°C (+/-5°C), but recently we had a day below -15°C and the camera board temp sensor showed only +4°C at the lowest. Still, the star images and other details verified the heating had a good effect. 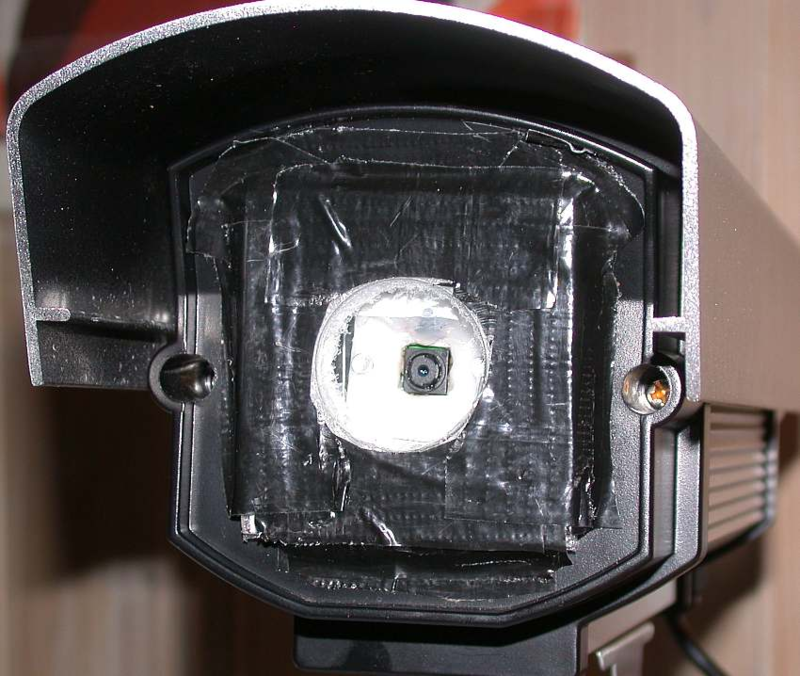 A friend showed interest in setting up a similar camera with heater, so that provided a chance to improve on the design. Clearly, the original “birds nest” implementation did leave something to be desired. My friend also wanted to accommodate 3 temperature sensors, one for the camera board (“CMOS”), one for camera house (“BODY”) and one for the outside (“OUT”). That meant an even bigger nest or something slightly smarter would be required. The overall idea is based on a 4×6 cm prototype PCB board and a 2×13 Pin header soldered together in such a way that the board becomes a suitable add-on to the Raspberry PI. The mini relay for switching the heater on/off is placed on the opposite end of the board relative to the pin header, along with its control circuitry. Between the two there is room for a “bus” for multiple DS18B20 temperature sensors. One is placed on the board, screw connectors are provided for the other sensors off the board. As the DS18B20 sensors are “1wire” devices, they can be identified in software via their unique serial numbers. 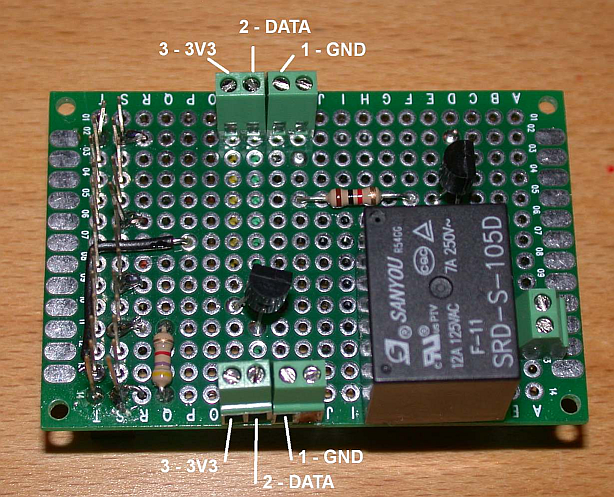 The board design thus allows both GPIO relay control + reading of 3 temperature sensors. This looks like an improvement to me. As designed, the board simply connects to the 28 GPIO pins of the Raspberry PI model B using the 2×13 Pin header. My friend is getting the Model B+ with more GPIO pins, but luckily the common pins of the two RPI models are the same, so the board should fit the B+ just fine. A couple of quick tests showed that both the relay control and the temperature sensor worked just fine, so the board is fully operational and awaiting the Mark2 camera board heater element to be completed. After completing the Mark2 heater board, I received some PCB Pin connector kits. They are possibly better alternatives than the screw connectors, since you do not risk getting the polarity wrong once the board has been properly made. Still, I am quite happy with the current Mark2 board! Happy New Year! Again it has taken some time since the last blog entry, due to Christmas activities taking priority. 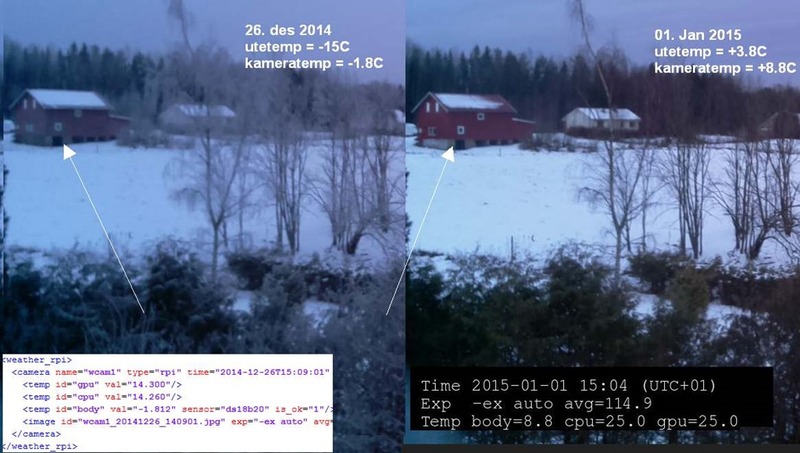 However, quite a few things have been happening with the Raspberry Pi weather camera in December. Just over Christmas we had a cold snap, and I noticed that the camera images appeared degraded in the cold, they used to be much sharper before, didn’t they? I decided to check, here is a comparison for the same time of day, comparable weather, but different temperatures on 26. Dec (-15C) and 01. Jan (+3.8C). You don’t have to be a rocket scientist to see that the image quality is degraded at lower ambient temperature. When comparing with older images from September 2014 when it was much warmer it is also clear that the relative sharpness of the 01. Jan image is also degraded compared to the warmer September days. I looked around to see if this was a known problem, and I did find a report of a very similar problem by someone in Germany (? ), where problems with focus were correlated with cool temperatures. More looking around landed me at a page with a lot of technical specifications for the Raspberry Pi. There is an interesting quote there that says “The threaded focus adjustment is set to infinity at the factory. Changing the focus from infinity to something closer requires that you turn the threaded lens cell counter-clockwise, moving the lens further away from the imaging sensor” . In other words, the Pi camera lens has fixed focus unless you start messing with it. It is a so called Extended Depth Of Field (EDOF) lens, which essentially is using some clever optical and internal processing tricks to reach a pretty decent, sharp image without the user having to perform any focusing at all. Note that it is not an auto-focus system, the lens is fixed at all times. So it is a decent and user friendly compromise if you operate the camera within the design specifications. Based on this, I suspected that there was an assumption of optimal temperature built into the PI camera EDOF system, for example an assumption room temperature (say, +20C). My take would then be that low winter temperatures causes the lens assembly to contract/deform in such a way that the lens is effectively brought slightly closer to the imaging sensor, resulting in a “beyond infinity” focus setting, and thus rather blurred images in the cold. This is bad news if you are using the PI camera for outdoor imaging at low temperatures, but is it possible to do something about it? Of course, one might consider changing the lens focus position by rotating the lens, but this is not practical in this case, considering the tiny lens and doing it in the cold. However, heating the camera board to near room temperature is perhaps more feasible? From amateur astronomy we know dew heaters are made by coupling a number of resistors in parallel and sending a small amount of current through them, generating something like 2W in total to heat the optical surfaces and thus avoid dew. 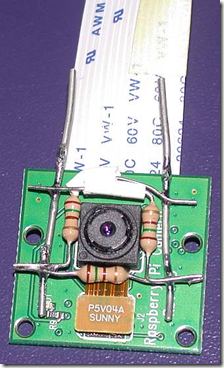 We could perhaps make a similar system using just a few resistors and generate something like 0.5W to heat just the camera board? The general idea is illustrated at left, using 3×150 Ohm resistors in parallel. If you apply 5V to this setup, it will generate 0.5 Watt. By placing the resistors close to the lens assembly, then much of the generated heat will be transferred to lens. By also measuring the temperature close to the lens one can determine how long/much the lens should be heated and optionally turn it on/off automatically as required. To make this work, one needs to insulate the resistors so they don’t lose the generated heat too fast. 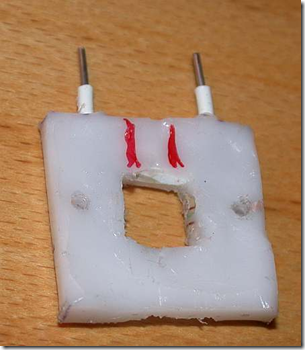 I decided to embed the resistors in melted plastic, as I had some hobby plastic that could be used. I made a simple form, put the resistor assembly in it, poured plastic over it and melted the plastic with a heat gun. After cooling and adjustments I had a basic lens heater element, shown below. The heat from the resistors will not dissipate as easily and will probably also cause a slightly more uniform heating around the lens. I could have put a small DS18B20 temperature sensor into the melted plastic, but I was unsure about whether it would survive. So instead I cut a trace for it after the plastic had cooled and glued in place between the red markings in the image below left. Before that I had soldered suitable wires to it. At the same time, holes were drilled to match the existing holes in the PI camera board. Here one needs to be accurate with the separation and placement of the holes. In the end I used M2 machine screws and a piece of plastic on the back side of the camera board with similar holes to hold the assembly in place. The purpose of the plastic on the back is to insulate both electrically and also temperature-wise. The DS18B20 temperature sensors are quite “friendly”, as you can connect many such sensors to the same wire/GPIO pin, they are so called “1-wire” sensors, although you also need wires for current. Once connected to the GPIO pins, the measurements turn up as small text files you can read. 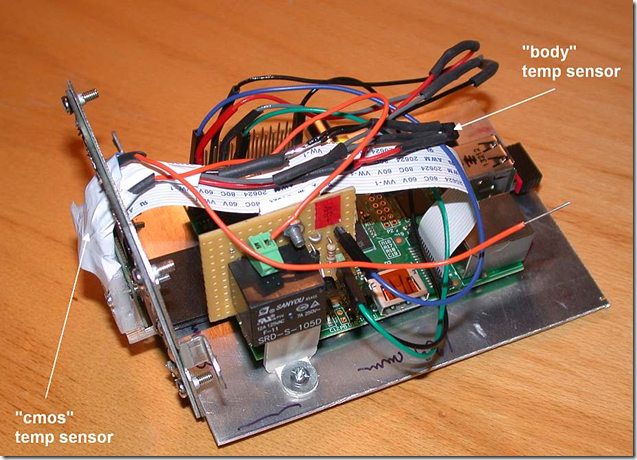 The method I use for reading the temperature sensors is described here and especially here . 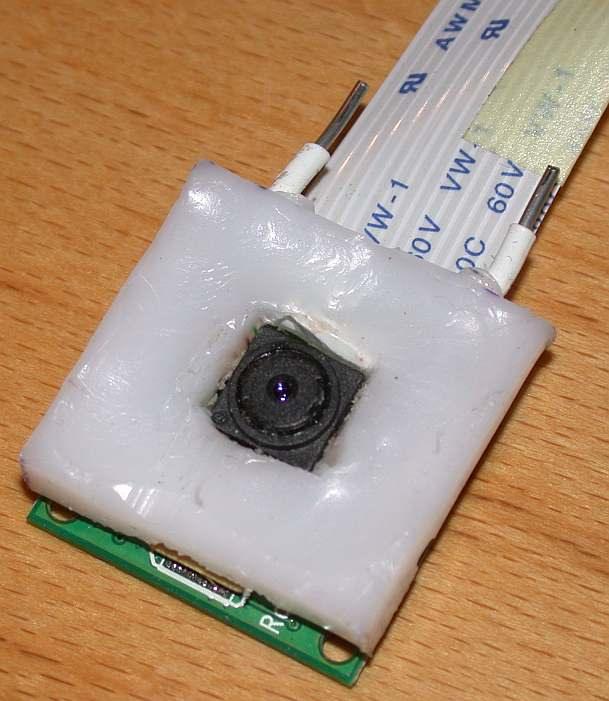 Since the weather camera images are scheduled using crontab, the driver for using 1-wire sensors must be loaded at system start up, there is a page describing how to do that here. In a previous post, I discussed how to control a relay, and now this could come into use. Quite possibly, one does not want the heater to be on at all times. We have very variable temperatures during the winter, and when the sun is high in the summer it can get rather warm. So a system for control the applied heat is required. If a separate power supply is used and the socket is accessible, one may do it manually. But in this case, the socket is not conveniently located and I eventually want 100% automatic temperature control. 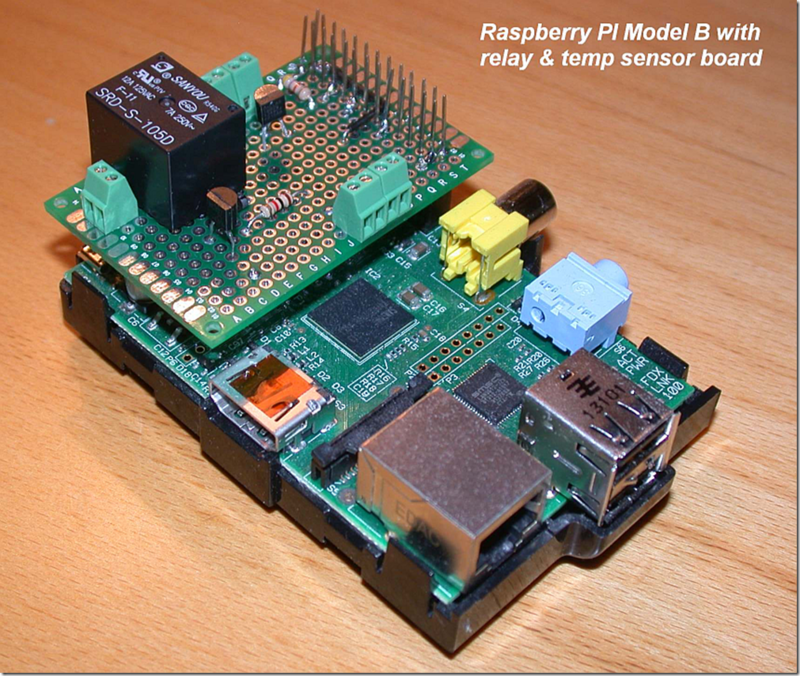 A simple solution to this is to use the relay board, allowing the power to the lens heater to be controlled from the PI itself, even when the heater is powered from a separate power supply. Then it also becomes possible to automate the heater control, by evaluating the temperature sensor embedded in the heater. Typically, one may want to turn on the heater if the temperature drops below +10C and turn it off when it exceeds +20C, or something of that nature. Such a thing is possible to do from software, using the relay. 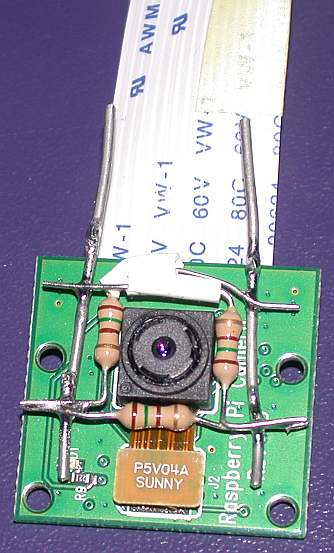 Adapting a relay board inside the camera housing was not part of the original weather camera design. The PI was simply placed on a 85mmx123mm aluminium plate that slides into the tracks in the inside of the camera housing. To fit the relay, I found a piece of unused plastic that could serve as a relay board holder. Adapting the relay board required a couple of holes to be drilled, and checking that the final assembly still fit inside the housing. There are probably far more elegant ways of connecting it all than what is shown below, it is a bit of a “bird’s nest” :-) But it shows where the temperature sensors are and also that the wires are connected to a 28 pin pin-header on the far side, so nothing is soldered directly to the GPIO Pins of the PI (Model B in this instance). If required, the whole thing can easily be disassembled. In the image above, all wiring is done, except for the power to the heater and power to the PI itself. 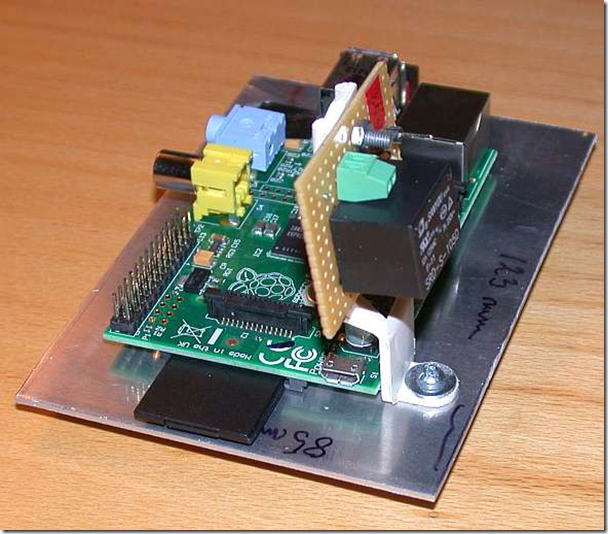 Notice that he PI camera board + lens heater assembly is placed on the front side of the plate holding it. This is different from before, and places the camera closer to the front glass. 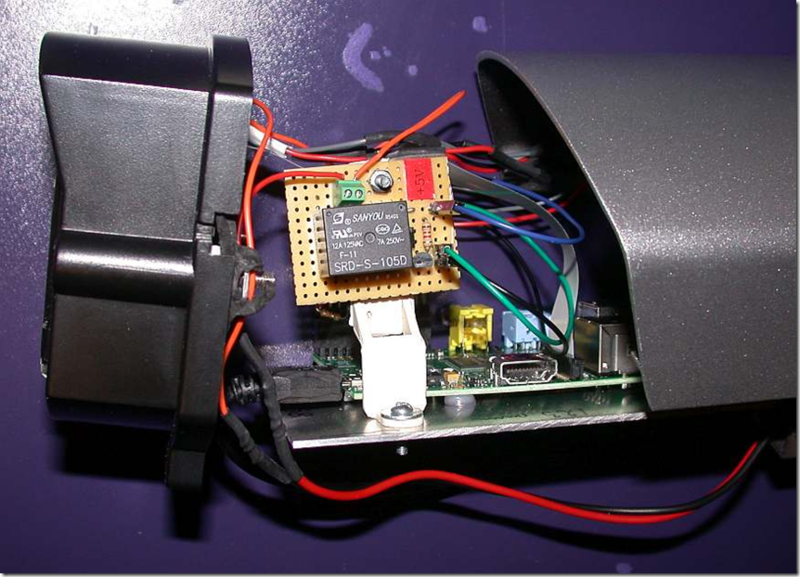 The PI is powered via a micro USB cable (black in the image below), and the lens heater is connected to the red/black power cable via the relay. The whole thing then slides inside the housing, using the tracks on the inside walls. A likely improvement and simplification if I was to make it again, would be to integrate the plate the PI sits on with the actual holder of the camera/heater as one piece. 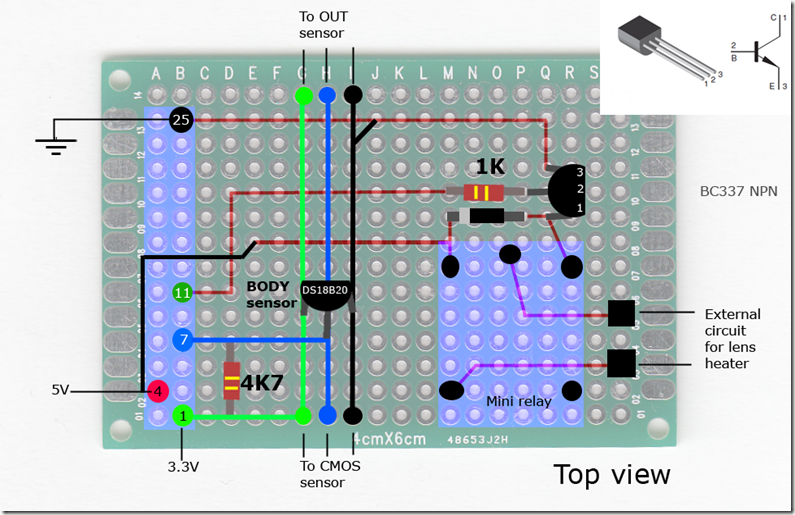 Another likely improvement would be to create a “breakout board” for both the relay and temperature sensors. That would eliminate the need for much of the messy wiring. So the current solution should be considered a prototype. Below is the new front of the camera, now a combination of the old dew fix and the new lens heater. 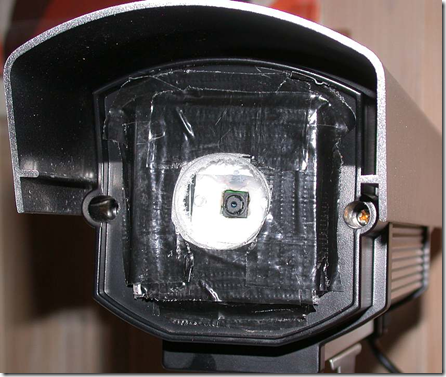 The lens heater in this configuration should also help to prevent dew, since the back side of the glass is now heated. Once assembled, I was eager to test it. First step was to check that the camera still worked, and that it was possible to read both temperature sensors. The 1-wire sensors kept their promise and both showed data. Each sensor has a unique serial number, but you cannot say which is which by looking at the serial number, you have to observe the behaviour. After some simple experimentation, I was able to determine the “body” sensor and the “cmos” sensor and their respective serial numbers. Then the real test began, by applying current to the lens heater. 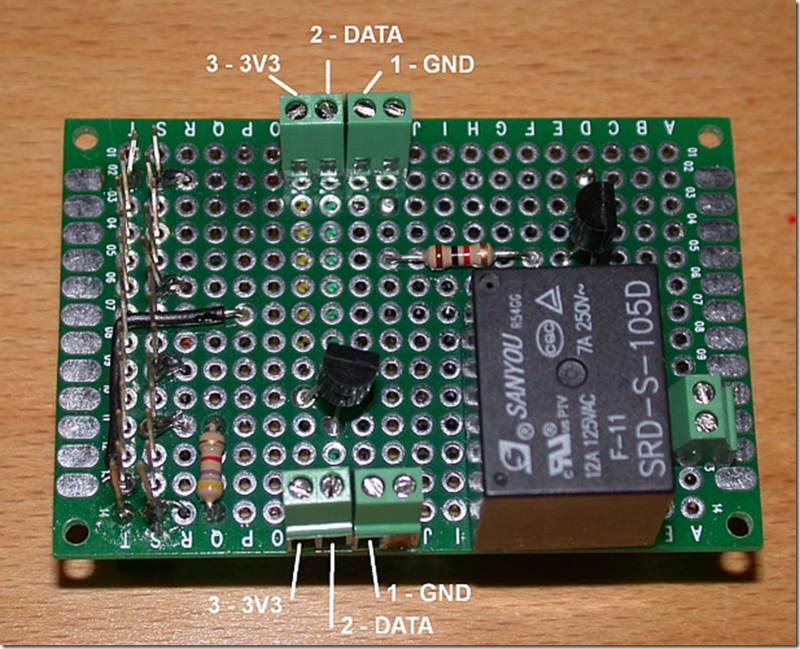 To switch the relay on/off, I used the C code found in the article Raspberry Pi – Driving a Relay using GPIO, i.e. the same method as in Raspberry Pi – Controlling a Relay. After switching on the heater current, the “cmos” temperature sensor started to report higher values. Success! During the initial testing, the outside temperature was about +2C, and before heating began the cmos temperature sensor reported just over 5C. After switching on the 5V heater current, the temperature increased gradually over 45-60 minutes until it stabilised around +17C. This was pretty good! If more power is needed, it is possible to run the heater at 6V or higher, one just needs to check that the power rating of each resistor is not exceeded, we don’t want anything to catch fire! How about image quality? This is the best part, the sharpness is dramatically improved. At the time of writing, it is dark. But I will write a new post tomorrow, comparing daylight images to previous images at the similar ambient temperature conditions. To conclude, the heater works and it has the desired image quality effect!